Get ready to take that leap… connecting to your inner “Super Hero” (Hanuman). You will learn how to intelligently and efficiently open the Hamstrings and Hips Creating space and freedom in the body. Stirring up the Shakti and tapping into our most creative energy pool in the body! This vinyasa based practice will begin with a flowing standing sequence followed by a long juicy floor section. Be prepared to go 360 degrees around the hips and hamstrings. Juicy Lucy! This challenging playful workshop class is for the yogi who desires more than what the standard yoga class offers. Tap into your deep core, move and flow from your center and stand true in your power with grace. We will tap into our deep core connections, wake up & strengthen the upper body as we learn exercises & variations that will help build awareness to safely and skillfully practice crow (and various transitions), headstands, handstands, forearm balances and creative fun variations. Come ready to tap into your true power, flow with grace and dance with gravity! Workshop #3 “VIN -YIN” 1/2 Vinyasa & 1/2 Yin– All Levels Welcome. Experience the Yin/Yang factor in this perfectly balanced 2 hour practice. A one hour Vinyasa Flow practice that builds heat and gets prana/energy flowing through the body, followed by a 1 hour Yin practice, focusing on the connective tissue and fascia. Vin Yin allows us to dive deep into unexplored layers of tension and patterns of holding in the body. Float off your mat feeling balanced and blissed out! Workshop One, Two or ALL Three? 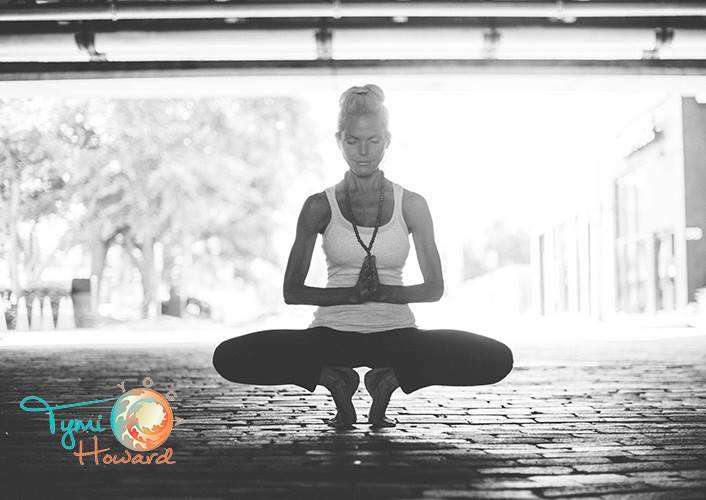 Single Workshop 65 each or 165 for ALL Three Please feel free to contact Townsville Yoga Hub for more information on 4772 0002 or contact here to book https://townsvilleyogahub.com.au/tymi-howard-yoga-workshop-weekend/ !